The University of Indianapolis men’s basketball team wrapped up its regular season 23-3 overall, 15-3 in the Great Lakes Valley Conference, on Thursday, Feb. 27, with a win over Saint Joseph’s College, 109-102. 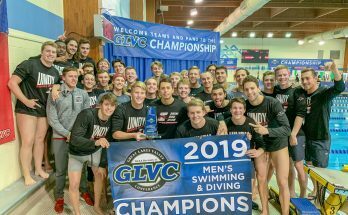 The victory concluded a historic regular season for UIndy as the Hounds tied with the University of Wisconsin-Parkside Rangers for best record in the GLVC East, claiming a share of the GLVC East Division title. Leading the Hounds in their victory were senior guard Reece Cheatham and redshirt sophomore guard Jordan Loyd, who scored 26 and 20 points, respectively. Cheatham’s 26 points helped enshrine him as the 24th player in school history to score more than 1,200 career points, while Loyd’s 20 was good for a career high. Redshirt junior Brennan McElroy looks to make a layup against a University of Southern Indiana defender. UIndy fell at home the Saturday before, however, losing to the rival Bellarmine University Knights 96-81. The loss against the Knights snapped UIndy’s 10-game winning streak and handed the team its first home loss of the season. The Greyhounds held the lead just once early in the first half and failed to regain it during the rest of the contest. The Knights were able to keep a safe distance from the Hounds on the scoreboard, by being statistically on fire from outside the arc with 14 3-pointers. Head Men’s Basketball Coach Stan Gouard said the Knights’ shooting performance damaged UIndy’s chances of keeping the game close. 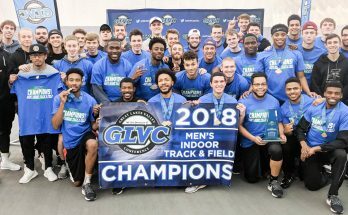 The Hounds began their last home stand of the season earlier that week, on Thursday, Feb. 20, when they hosted the University of Southern Indiana Screaming Eagles. 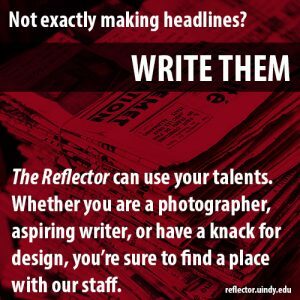 Despite being one of only two teams that had knocked off UIndy earlier in the season, the Screaming Eagles could not replicate that performance in Nicoson Hall, falling to the Hounds 92-67. Junior forward/center Joe Lawson led the Hounds with a double-double, finishing with 25 points and 10 rebounds. Lawson said that heading into and during the game, the team felt a sense of revenge towards the Screaming Eagles. During the game, the Screaming Eagles held the lead once, with the first bucket of the contest. From that moment on, after Cheatham answered USI’s two-point bucket with a 3-pointer, to give UIndy the lead 3-2, the Hounds never looked back. By the end of the first half, UIndy led USI in commanding fashion, 53-35. In the second half, USI surged back to bring the deficit down to seven points nearly midway through. 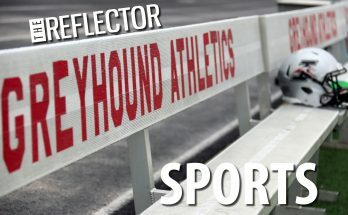 The Greyhounds adjusted, however, and were able to regain a commanding lead for the rest of the game, cruising to a significant conference win. Following the victory, Gouard said that he was proud of the effort by his players. The Hounds will now begin postseason play in Evansville, Ind., on Friday, March 7, as they take on the Knights for the third time this season at the Ford Center in the quarterfinals of the 2014 Deaconess GLVC Men’s Basketball Championship Tournament as the No. 3 seed. The game is set to begin at 8:30 p.m. CST.